Nostalgia is a wonderful thing. 90s kids will reminisce about a wonderful childhood of M.A.S.K., GI Joe, Thundercats, Teenage Mutant Hero (Ninja) Turtles and – of course – Transformers. 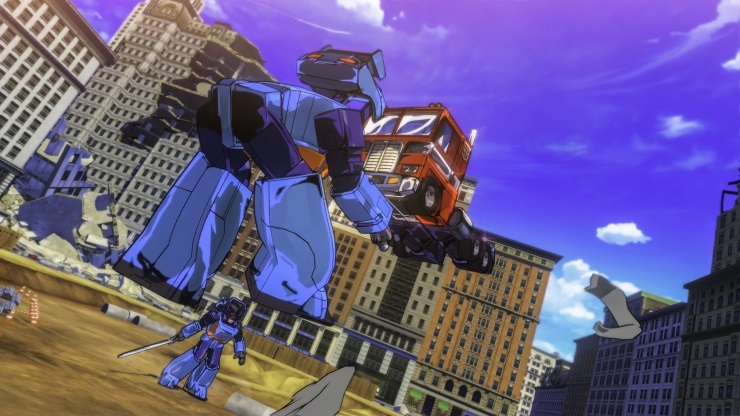 There’s a renaissance of sorts going on as well; Thundercats got a new cartoon and The Turtles and Transformers still exist in many different forms (still popular in spite of Michael Bay, not because of him). Thing is: these are reboots, the names are the same; but they’re not what we remember from our tender years. 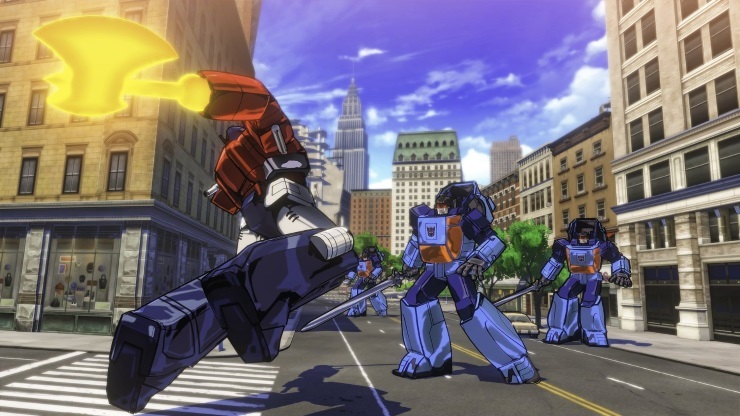 Transformers Devastation is a different beast, it’s a game that wears nostalgic influence not on its sleeve but in its core. To this game, nostalgia is the Matrix of leadership. This is evident from the boxart alone. This isn’t one of the newer series of Transformers or the films; we’re talking original Generation One. Even the opening menu evokes an old-school feel with a sparse screen crackling with static, while showcasing its options. It’s like an old DVD menu screen and really adds to the overall experience. In-game the character models look stunning, I’ve never seen cel-shading look quite this good before. Chunky outlines surround beautifully bright colours as metallic style shading cascades across the panels, and it’s all animated beautifully. This is some exceptional design work that’s completely wondrous to behold. The environments, while quite bland early on, at least make some use of verticality with fights taking place on rooftops and skyways with the city below. As the game progresses Platinum ramps the spectacle up, with oodles of large, moving background artifacts, lightshows and particle effects giving later areas a real epic feel. All this would mean nothing if the game wasn’t much cop, but this is where the other big influence becomes apparent. Being a Platinum game you expect it to have a good fighting system, and it does. In fact, it’s been lifted virtually wholesale from Bayonetta. If nostalgia is the Matrix, then Bayonetta is the Energon providing the game’s power. Combat animation flows beautifully as your Autobot of choice wails away on the targets presented to you for your smashing pleasure. It’s an amazing feeling to deliver a series of light and heavy attacks to then follow up with turning into a car and slamming into the enemy before landing back on your feet and continuing the assault. 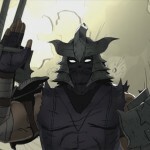 The lack of a combo counter is an unusual omission as it removes some of the joy of delivering a lengthy sequence of unbroken hits, but you’ll be too busy staring in wide eyed wonder to care. Hitting R1/RB to dodge hits at the last moment activates witch time (in all but name), slowing things down for you to get more combo hits in without taking damage, while areas are sealed off by doors that require sequential attacks to break through. Heck, even the screens that introduce new enemy types to you are from that same Platinum-template. This homage to Bayo is no bad thing as it has one of the greatest fighting systems around, and it’s good to see it put to good use here. 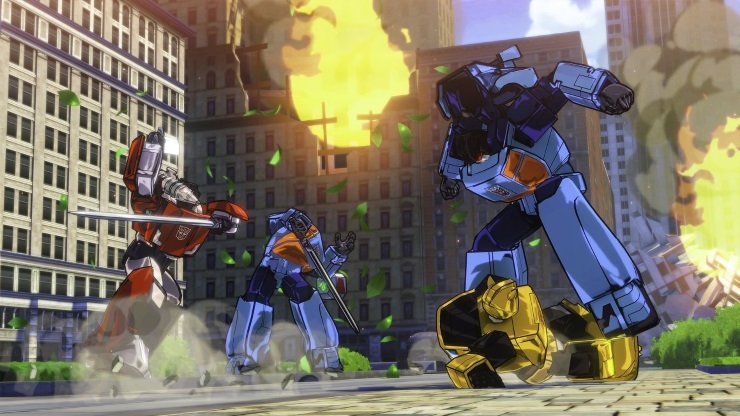 You can choose from five selectable Autobots, each with their own fighting style to bring to the table. Optimus Prime is the usual “good at everything” character; Bumblebee is small and nippy; Wheeljack has a shield; Sideswipe has good range, and Grimlock is a grappler. 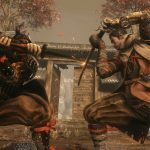 The styles are quite distinct with certain advantages applied to each, but you can easily complete each chapter regardless of your choice. If you decide you don’t like a particular one then you can switch between them before each chapter, or at select points in at an Autobot logo. Each character has four weapon slots, in which you can equip two ranged and two melee types. Ranged weapons have limited use due to consuming energon (which can be picked up from defeated enemies), while melee has no such restriction. Downed enemies and bosses can leave behind weapon pick-ups which can also be equipped. Did you like that sword you saw that Decepticon using? Try it out for yourself. Even older weapons once discarded have some use, as they can be infused into other weapons to create more powerful types. It’s an excellent system that rewards experimentation and tinkering. It all sounds great, but there are issues. Some level items clip into the world geometry, resulting in cars and other items being partially submerged in the ground, and there’s a repetition of enemy models that’s hard to get over. Shielded enemies mix things up a bit in the combat, but the shields can only be destroyed by a vehicle ram, and while you can chain a vehicle attack in after a ram, it’s highly unlikely you’ll be able to do it more than once, meaning that you then have to get a run up to attack the next shielded enemy that appears – it kind of ruins the combat flow. 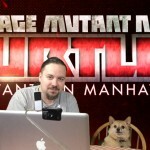 Platinum has gone to admirable lengths to get the original voice cast to reprise their roles, but unfortunately some of the replacements for those who have sadly left us just sound a little odd, with Starscream losing a little bit of the malice that was evident in the original actor’s performance. The less said about the music the better: it’s a terrible faux-rock that repeats in every encounter, and it won’t be long until you learn to ignore its presence. It’s woefully short, too. You can blitz through it in around four or five hours, and although there’s a bunch of objective based side items within the levels and a challenge mode that sees stages unlocked through repeat story play, they’re no consolation. The cliffhanger ending hints that there were ideas on to the table as to where to push the story forward, but it feels that’s been held back for a sequel or, god forbid, DLC. 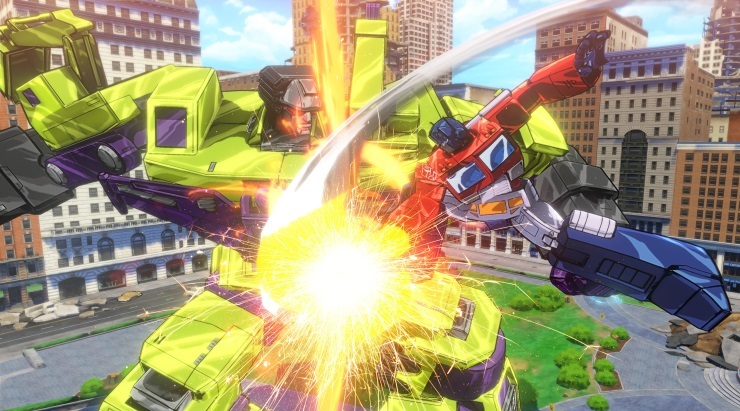 Regardless of length, Transformers Devastation is a wonderful blend of pure 90s nostalgia and one of the best fighting systems in games. 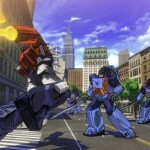 It truly feels like a Transformers videogame should, and one that fans have always wanted. 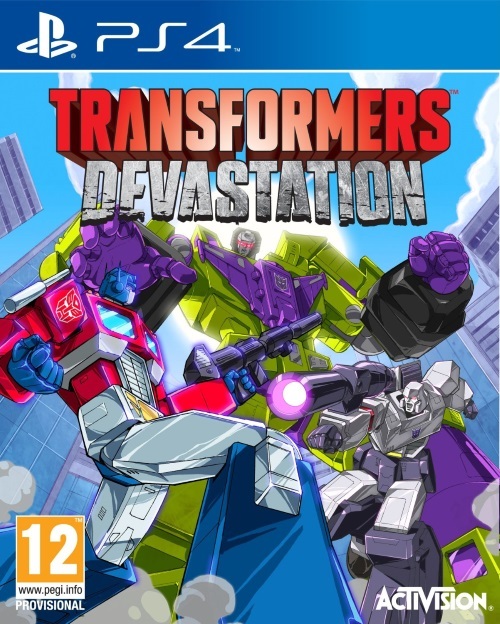 Whether or not you’re a fan of the original Transformers or not, this is a great game. The fan service will obviously make it more enjoyable for some, but anyone will derive enjoyment from this. 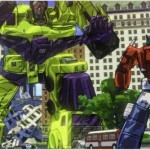 Transformers Devastation is a fantastic love letter to G1 Transformers fans, and a great game in its own right.